Watch Beautiful Noize Entertainment artists Artis, Ming & DJ NahSla on The Soul Suite with Marcus Noel (Part 4) recorded live on [6-23-13] at World Tuned Radio (WTR) in Oceanside, CA freestyle session and final call ins. 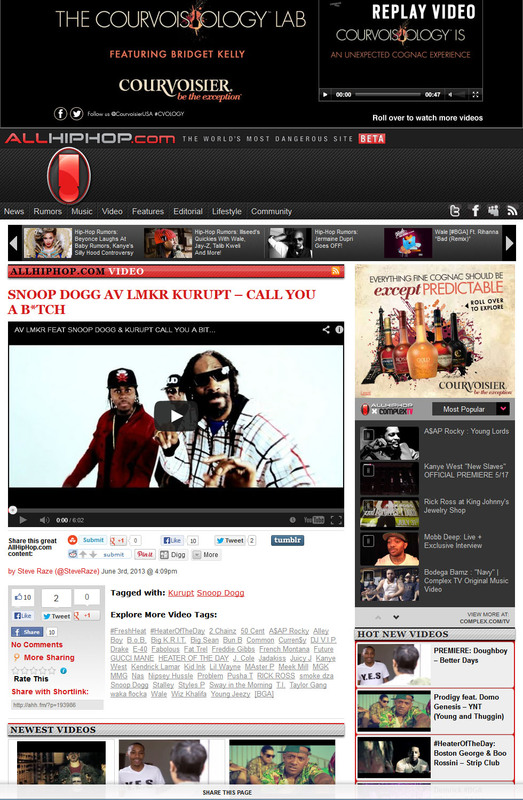 Click the menu button and go to USTREAM to watch live. Watch Beautiful Noize Entertainment artists Artis, Ming & DJ NahSla on The Soul Suite with Marcus Noel (Part 3) recorded live on [6-23-13] at World Tuned Radio (WTR) in Oceanside, CA Discussing Fall 2013 music & video releases, Beautiful Weeks, Before The Fame, social media, marketing, support & more. Watch Beautiful Noize Entertainment artists Artis, Ming & DJ NahSla on The Soul Suite with Marcus Noel (Part 2) recorded live on [6-23-13] at World Tuned Radio (WTR) in Oceanside, CA discussing musical influences, chemistry, creativity and more. Watch Beautiful Noize Entertainment artists Artis, Ming & DJ NahSla on The Soul Suite with Marcus Noel recorded live on [6-23-13] at World Tuned Radio (WTR) in Oceanside, CA discussing the inception of Beautiful Noize Entertainment LLC., artistry, roles, publications, music, video production and more. TONIGHT ON The Soul Suite with Marcus Noel RADIO SHOW! 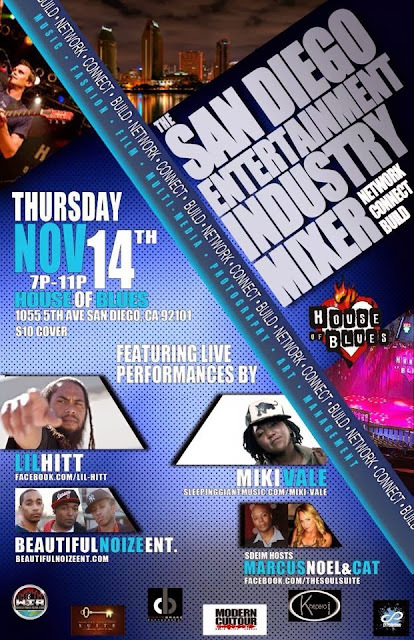 We will be highlighting the the Artists chosen to perform at the November 14th San Diego Entertainment Industry Mixer at The House of Blues. Tune in to hear interviews with Beautiful Noize Entertainment, Lil Hitt and maybe a call in from the one and only Miki Vale. We will be showcasing them and some of their newest tracks. 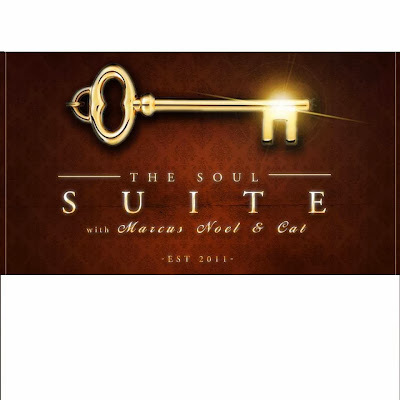 ****NEW TIME****TUNE IN from 8pm to 10pm PST on The Soul Suite with Marcus Noel. Join Hosts Marcus Noel & Catherine R Rodrigues our topic via Android, iPhone apps (under WTR), FB chat, or even call in to 760-967-8863 to give your opinions and thoughts. Join us as we bring the very best in R&B, Soul, Neo-Soul, and those old school jams. Go to www.worldtunedradio.com click the menu button to USTREAM & watch live. San Diego Reggae, Hiphop and R&B Artist LIL HITT, Also featuring the very talented Miki Vale, a strong and dynamic singer/songwriter who breathes new life into Hip Hop music. And introducing to San Diego for the first time the multi talented Group of artists from Beautiful Noize Entertainment, Artis, Ming and DJ NahSla. This will be one of SDEIM's best showcase of what Southern California has to offer to date. Look for more information including artist music and profiles to come. Please go to our page and press LIKE. Join the SDEIM group page. 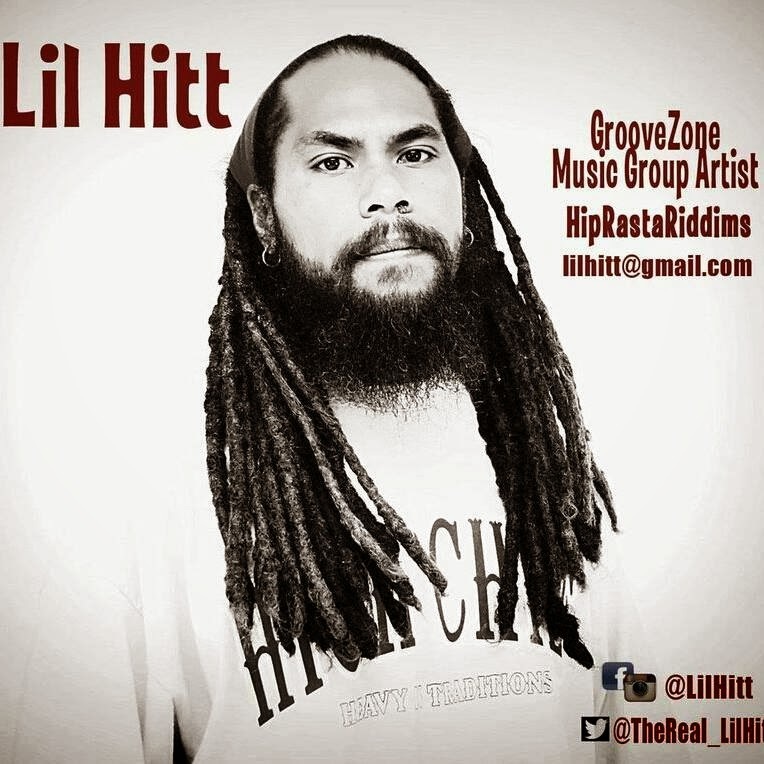 San Diego Reggae, Hiphop and R&B Artist LIL HITT, Also featuring the very talented Miki Vale, a strong and dynamic singer/songwriter who breathes new life into Hip Hop music. And introducing to San Diego for the first time the multi talented Group of artists from Beautiful Noize Entertainment, Artis and Ming. Beautiful Noize Ent., LLC Presents Artis "Beautiful Weeks" #22 [World Premiere] Reintroducing straight raw lyricism containing no effects, no post processed vocals delivering straight raw bars capturing and representing the essence of Hip Hop. © 2013 Beautiful Noize Ent., LLC. Beautiful Noize Ent., LLC Presents Ming "Beautiful Weeks" #21 [World Premiere] Reintroducing straight raw lyricism containing no effects, no post processed vocals delivering straight raw bars capturing and representing the essence of Hip Hop. © 2013 Beautiful Noize Ent., LLC. Beautiful Noize Ent., LLC Presents Artis "Beautiful Weeks" #20 [World Premiere] Reintroducing straight raw lyricism containing no effects, no post processed vocals delivering straight raw bars capturing and representing the essence of Hip Hop. © 2013 Beautiful Noize Ent., LLC. 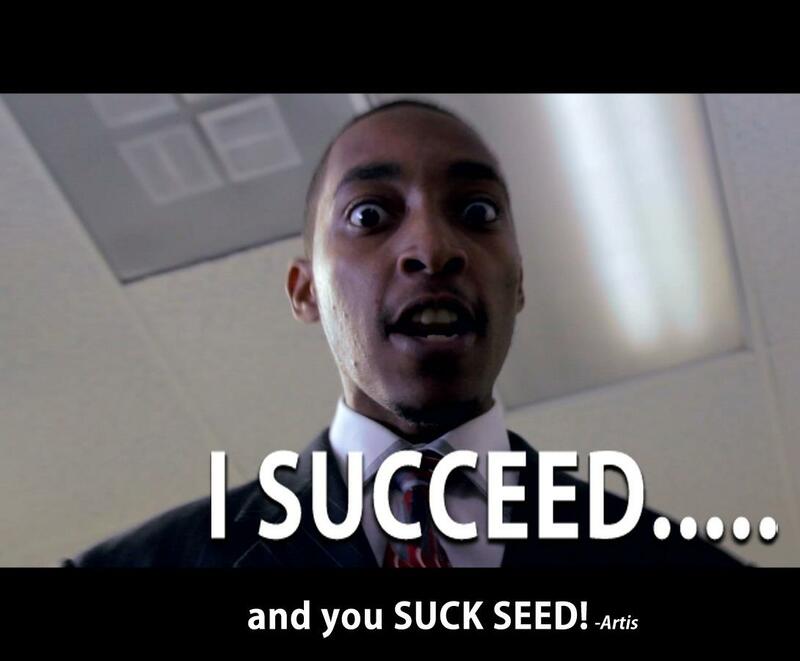 Beautiful Noize Ent., LLC Presents Artis "Beautiful Weeks" #19 [World Premiere] Reintroducing straight raw lyricism containing no effects, no post processed vocals delivering straight raw bars capturing and representing the essence of Hip Hop. © 2013 Beautiful Noize Ent., LLC. Beautiful Noize Ent., LLC Presents Ming "Beautiful Weeks" #18 [World Premiere] Reintroducing straight raw lyricism containing no effects, no post processed vocals delivering straight raw bars capturing and representing the essence of Hip Hop. © 2013 Beautiful Noize Ent., LLC. 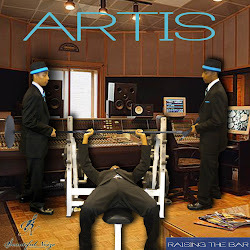 Beautiful Noize Ent., LLC Presents Artis "Beautiful Weeks" #17 [World Premiere] Reintroducing straight raw lyricism containing no effects, no post processed vocals delivering straight raw bars capturing and representing the essence of Hip Hop. © 2013 Beautiful Noize Ent., LLC. Beautiful Noize Ent., LLC Presents Ming "Beautiful Weeks" #16 [World Premiere] Reintroducing straight raw lyricism containing no effects, no post processed vocals delivering straight raw bars capturing and representing the essence of Hip Hop. © 2013 Beautiful Noize Ent., LLC. Beautiful Noize Ent., LLC Presents Artis "Beautiful Weeks" #15 [World Premiere] Reintroducing straight raw lyricism containing no effects, no post processed vocals delivering straight raw bars capturing and representing the essence of Hip Hop. © 2013 Beautiful Noize Ent., LLC. 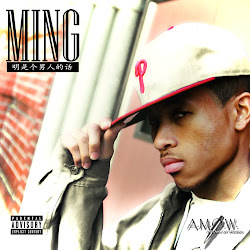 Beautiful Noize Ent., LLC Presents Ming "Beautiful Weeks" #14 [World Premiere] Reintroducing straight raw lyricism containing no effects, no post processed vocals delivering straight raw bars capturing and representing the essence of Hip Hop. © 2013 Beautiful Noize Ent., LLC. DETAILS: Beach & Water shots captured at Dana Point Harbor. Wardrobe: Dress code will be subjected to featured background & character role. 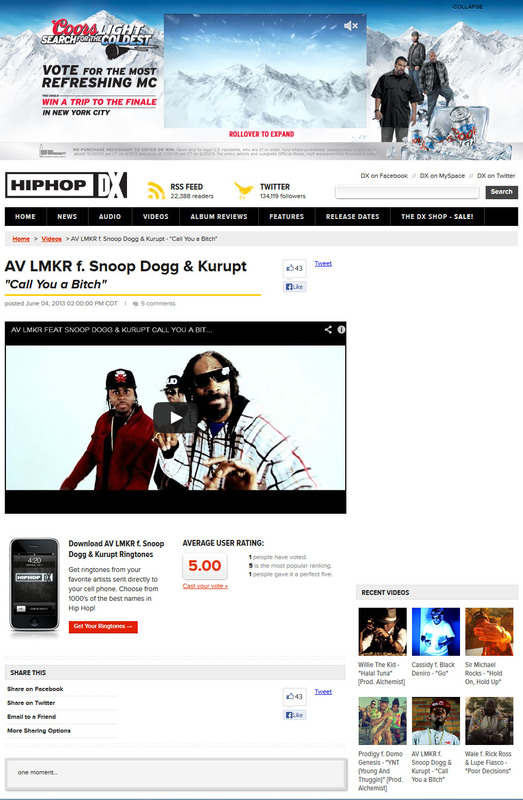 Description: Participants featured in the music video be featured as background talent in several scenes throughout the video. We are looking for you to be very natural and dress according to your character’s description. Scenes include: interacting with the artist, close ups of faces and body shots, vibing, chilling, engaging and acting at the beach, on the side of street to the music, etc. All looks, shapes and sizes are welcome and encouraged to submit. 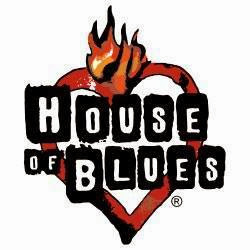 Your performance with artists Artis & LazaJuan will serve as lead shots in the project as directed showcasing real life, a good time and down to earth people around Los Angeles, CA. Shoot Dates: (6/20/2013; 6/27/2013; 6/28/2013 & More Dates TBA) Will coordinate with your schedule for best availability. Project Synopsis: Setting takes place in Los Angeles, CA with Beautiful Noize Entertainment artists Artis & Independent R&B Artist, LazaJuan. No stunts or major effects will be involved, just a story depicting real/natural life showcasing beach, street, and scenic views, as well specific indoor shots throughout the city. Please stay tuned for more information, more days will be posted coming soon. We look forward to a great shoot with everyone contacted and involved. We thank you for your participation, and we appreciate all the love and support you have shown us. Beautiful Noize Ent., LLC Presents Artis "Beautiful Weeks" #13 [World Premiere] Reintroducing straight raw lyricism containing no effects, no post processed vocals delivering straight raw bars capturing and representing the essence of Hip Hop. © 2013 Beautiful Noize Ent., LLC. Beautiful Noize Ent., LLC Presents Ming "Beautiful Weeks" #12 [World Premiere] Reintroducing straight raw lyricism containing no effects, no post processed vocals delivering straight raw bars capturing and representing the essence of Hip Hop. © 2013 Beautiful Noize Ent., LLC. 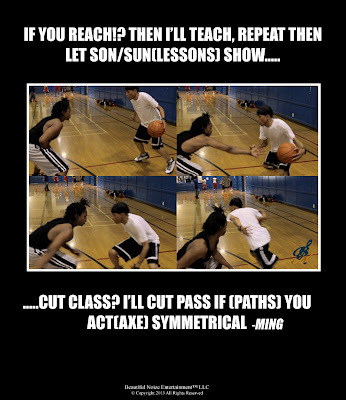 Beautiful Noize Ent., LLC Presents Ming "Beautiful Weeks" #7(All I Do 6/3/13 Update & Light Bars) [World Premiere] Reintroducing straight raw lyricism containing no effects, no post processed vocals delivering straight raw bars capturing and representing the essence of Hip Hop. © 2013 Beautiful Noize Ent., LLC. Beautiful Noize Ent., LLC Presents A.D. "Beautiful Weeks" "Freestyle" #6 [World Premiere] Reintroducing straight raw lyricism containing no effects, no post processed vocals delivering straight raw bars capturing and representing the essence of Hip Hop. © 2013 Beautiful Noize Ent., LLC. Beautiful Noize Ent., LLC Presents Ming & Artis "Beautiful Weeks" "Freestyle" #5 [World Premiere] Reintroducing straight raw lyricism containing no effects, no post processed vocals delivering straight raw bars capturing and representing the essence of Hip Hop. © 2013 Beautiful Noize Ent., LLC. Beautiful Noize Ent., LLC Presents Ming "Beautiful Weeks" "Freestyle" #4 [World Premiere] Reintroducing straight raw lyricism containing no effects, no post processed vocals delivering straight raw bars capturing and representing the essence of Hip Hop. © 2013 Beautiful Noize Ent., LLC. Beautiful Noize Ent., LLC Presents A.D. "Beautiful Weeks" Freestyle #3 [World Premiere] Reintroducing straight raw lyricism containing no effects, no post processed vocals delivering straight raw bars capturing and representing the essence of Hip Hop. © 2013 Beautiful Noize Ent., LLC. Beautiful Noize Ent., LLC Presents A.D. "Stay" (Remix) Produced by Augie Ray. Another release from #BeautifulWeeks dope new track by A.D. doing what he does best. Be sure to tune in for more content and releases. © 2013 Beautiful Noize Ent., LLC. Song: "Stay" (Remix) | Artist: A.D. | Producer: Augie Ray | Mixer: Monsta | Label: Beautiful Noize Ent. Beautiful Noize Ent., LLC Presents Artis & Ming "Beautiful Weeks" Pt. 2 Reintroducing straight raw lyricism containing no effects, no post processed vocals delivering straight raw bars capturing and representing the essence of Hip Hop. © 2013 Beautiful Noize Ent., LLC. Experience raw, underground Hip Hop at it’s finest: uncut, unaltered, real and gritty. Beautiful Noize Entertainment presents Artis & Ming in their premiere release of “Beautiful Weeks” reintroducing straight raw lyricism containing no effects, no post processed vocals delivering straight raw bars capturing and representing the true essence of pure Hip Hop. © 2013 Beautiful Noize Ent., LLC. 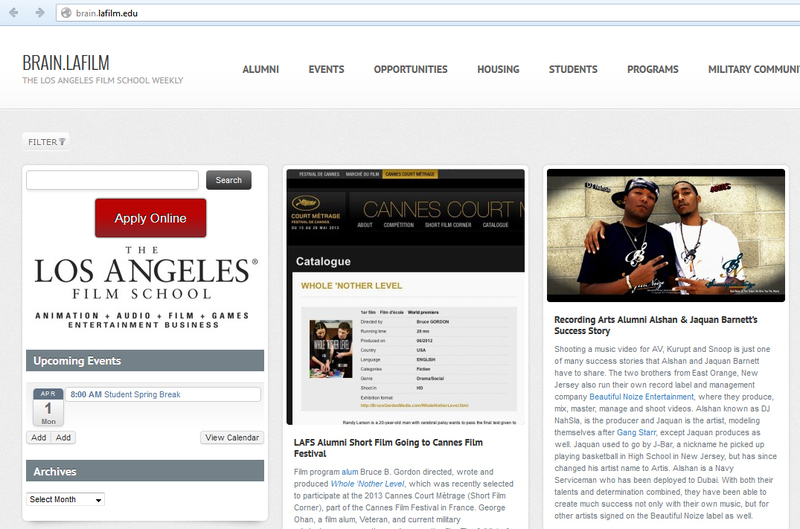 Follow Artis, Ming & DJ NahSla on Twitter: @Jqjbeezy, @YaBoyMing, @DJNahSla. Follow Beautiful Noize Ent: @BNEnt. Visit www.beautifulnoizeent.com. Beautiful Noize Ent., LLC Presents Artis & Ming "Beautiful Weeks" [World Premiere] Reintroducing straight raw lyricism containing no effects, no post processed vocals delivering straight raw bars capturing and representing the essence of Hip Hop. © 2013 Beautiful Noize Ent., LLC. Shooting a music video for AV, Kurupt and Snoop is just one of many success stories that Alshan and Jaquan Barnett have to share. The two brothers from East Orange, New Jersey also run their own record label and management company Beautiful Noize Entertainment, where they produce, mix, master, manage and shoot videos. Alshan known as DJ NahSla, is the producer and Jaquan is the artist, modeling themselves after Gang Starr, except Jaquan produces as well. Jaquan used to go by J-Bar, a nickname he picked up playing basketball in High School in New Jersey, but has since changed his artist name to Artis. Alshan is a Navy Serviceman who has been deployed to Dubai. With both their talents and determination combined, they have been able to create much success not only with their own music, but for other artists signed on the Beautiful Noize label as well. 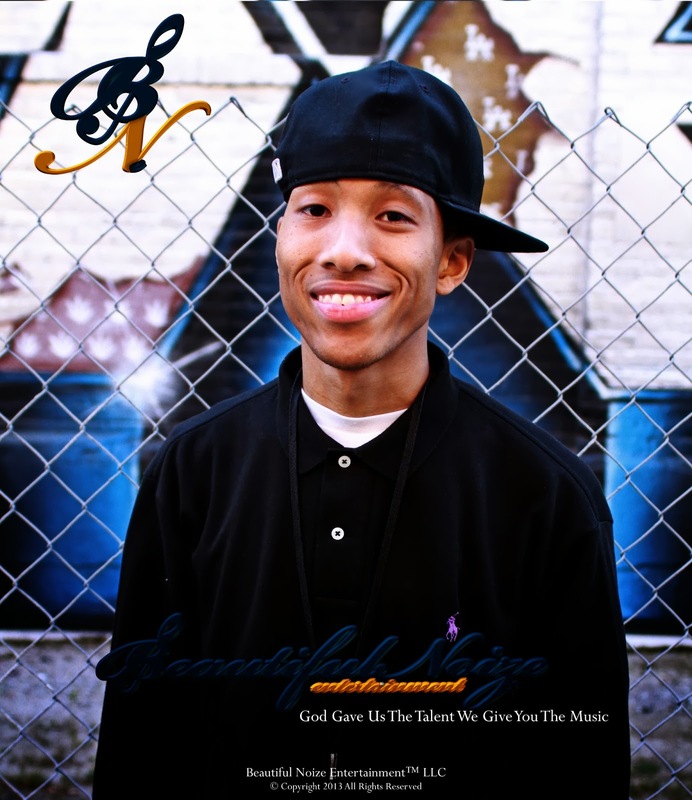 J-Bar had been pursuing music all through college at Susquehanna University, a small, predominately white private school in Pennsylvania. There he was in a music group called B.A.S.I.C. (Black And Succeeding In College) and they produced a few songs as well an album “Back 2 Basics” that had gained popularity on campus, however once he graduated he decided to go solo and take the name Artis. A few years back Alshan was invited to an Open House Tour of The Los Angeles Recording School and went just to check it out. But when he saw the facility, the equipment, and instructors, he knew it was something he had to pursue. He also met with admissions representative Rizen Eclarin, who pointed out all the benefits of receiving an audio engineering education. Having previously purchased Pro Tools and other audio equipment, Alshan knew the difficulty in navigating the software alone so decided to move to LA to enroll in the recording program. 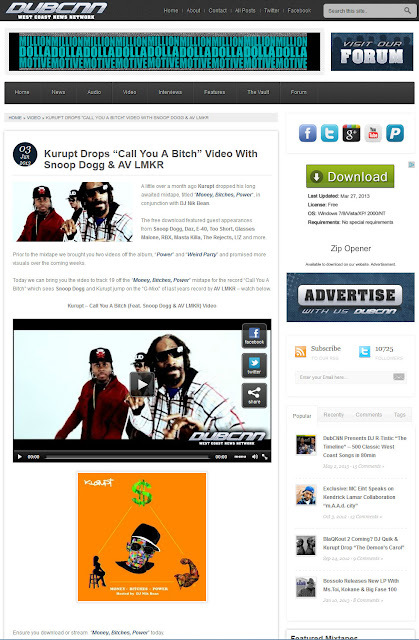 With their Beautiful Noize Entertainment company, they have produced albums for artists such as A.D and Ming, shot and produced dozens of music videos, including the viral hit “Find My Muffin”, a parody of Drake’s “Find Your Love”. They continue to work and expand their own musical library. Artis is currently working on his second mixtape, Raising The Bar 2, a lyrical freestyle series titled “Beautiful Weeks” and AlShan is currently working on the Executive Production of Ming, A.D. and his own mixtape as well as a joint venture mixtape with Artis. They also have been working with LAFS and LARS alum, including Rudy G of RG Recordings, Matthew Bennett and Bernard Lipscomb. Humanitarian efforts are in the works as well and so much more. Check out their music online at beautifulnoizeent.com. Beautiful Noize Entertainment Productions Presents RG Recordings East Coast Promo/Networking Tour "Road To Dub" (DE) Sponsored by Rudy G of RG Recordings In Association with Artis of Beautiful Noize Ent & AyooMeco LMKR. 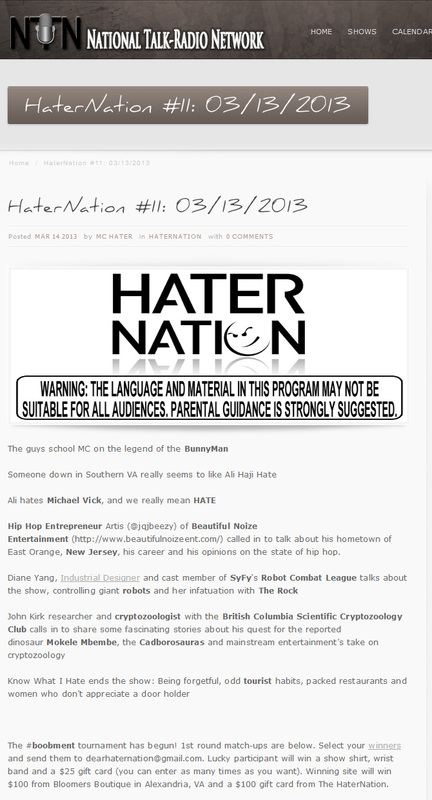 © 2013 Beautiful Noize Entertainment Productions. Beautiful Noize Entertainment Productions Presents RG Recordings East Coast Promo/Networking Tour "Road To Dub" (NC) Sponsored by Rudy G of RG Recordings In Association with Artis of Beautiful Noize Ent & AyooMeco LMKR. 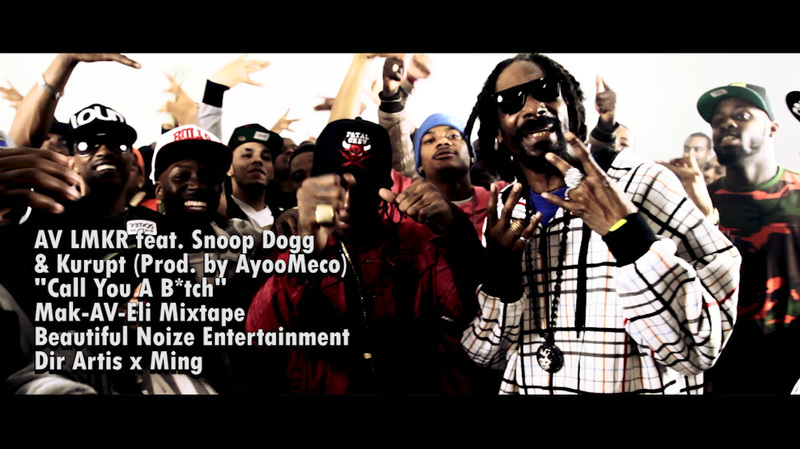 © 2013 Beautiful Noize Entertainment Productions. Beautiful Noize Entertainment Productions Presents RG Recordings East Coast Promo/Networking Tour "Road To Dub" (SC) Sponsored by Rudy G of RG Recordings In Association with Artis of Beautiful Noize Ent & AyooMeco LMKR. © 2013 Beautiful Noize Entertainment Productions. Check out [Part II] of #RoadToDub East Coast Promo Tour #ATL Where Rudy G (@RGRecordings) | (@AyooMeco) & Artis (@Jqjbeezy) Everyone Had An Uplifting Experience Visiting The "Martin Luther King Jr. National Historic Site," And Are Extremely Grateful For Life, Our Liberties & Opportunities As Minorities To Turn Our Dreams Into Realities. R.I.P. #MLKJR Always & Forever, We Thank You! Beautiful Noize Entertainment Productions Presents RG Recordings East Coast Promo/Networking Tour "Road To Dub" (ATL) [Part 2] Sponsored by Rudy G of RG Recordings In Association with Artis of Beautiful Noize Ent & AyooMeco LMKR. © 2013 Beautiful Noize Entertainment Productions. 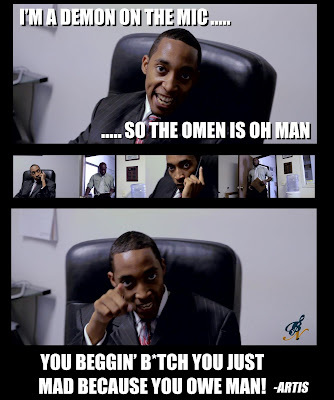 Hip Hop Entrepreneur Artis (@jqjbeezy) of Beautiful Noize Entertainment (http://www.beautifulnoizeent.com/) called in to talk about his hometown of East Orange, New Jersey, his career and his opinions on the state of hip hop. John Kirk researcher and cryptozoologist with the British Columbia Scientific Cryptozoology Club calls in to share some fascinating stories about his quest for the reported dinosaur Mokele Mbembe, the Cadborosauras and mainstream entertainment’s take on cryptozoology. Know What I Hate ends the show: Being forgetful, odd tourist habits, packed restaurants and women who don’t appreciate a door holder. The #boobment tournament has begun! 1st round match-ups are below. Select your winners and send them to dearhaternation@gmail.com. Lucky participant will win a show shirt, wrist band and a $25 gift card (you can enter as many times as you want). Winning site will win $100 from Bloomers Boutique in Alexandria, VA and a $100 gift card from The HaterNation. Beautiful Noize Entertainment Productions Presents RG Recordings East Coast Promo/Networking Tour "Road To Dub" (ATL) [Part 1] Sponsored by Rudy G of RG Recordings In Association with Artis of Beautiful Noize Ent & AyooMeco LMKR. © 2013 Beautiful Noize Entertainment Productions. Beautiful Noize Entertainment Productions Presents RG Recordings East Coast Promo/Networking Tour "Road To Dub" (NYC) Sponsored by Rudy G of RG Recordings In Association with Artis of Beautiful Noize Ent & AyooMeco LMKR. © 2013 Beautiful Noize Entertainment Productions. Beautiful Noize Entertainment Productions Presents RG Recordings East Coast Promo/Networking Tour "Road To Dub" (Philly/NJ) Sponsored by Rudy G of RG Recordings In Association with Artis of Beautiful Noize Ent & AyooMeco LMKR. © 2013 Beautiful Noize Entertainment Productions. 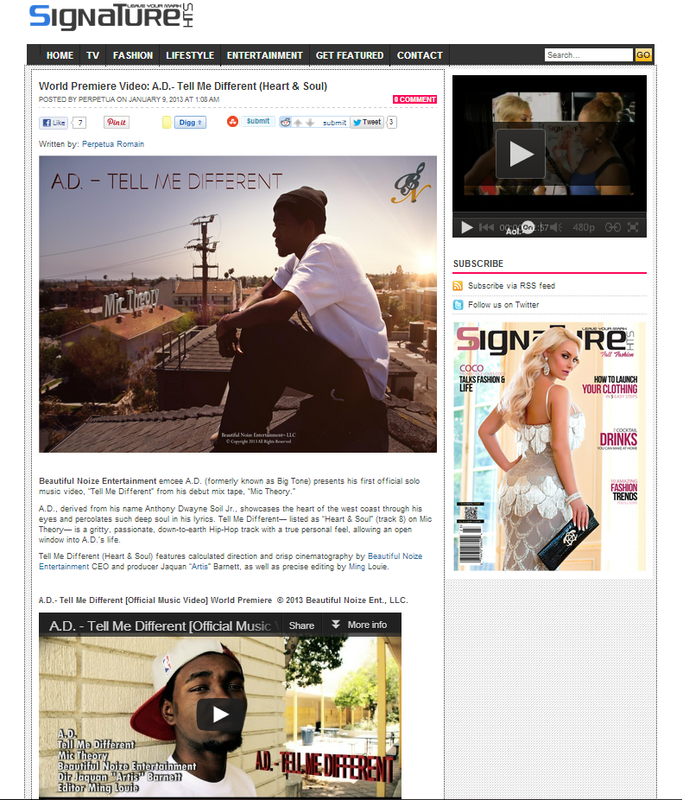 Watch A.D's "Tell Me Different" [Official Music Video] behind the scenes footage Part II as A.D. takes you around his hometown Visalia, CA! Music video by A.D. from his "Mic Theory" Mixtape. (C) 2013 Beautiful Noize Ent., LLC. - God Gave Us The Talent, We Give You The Music. 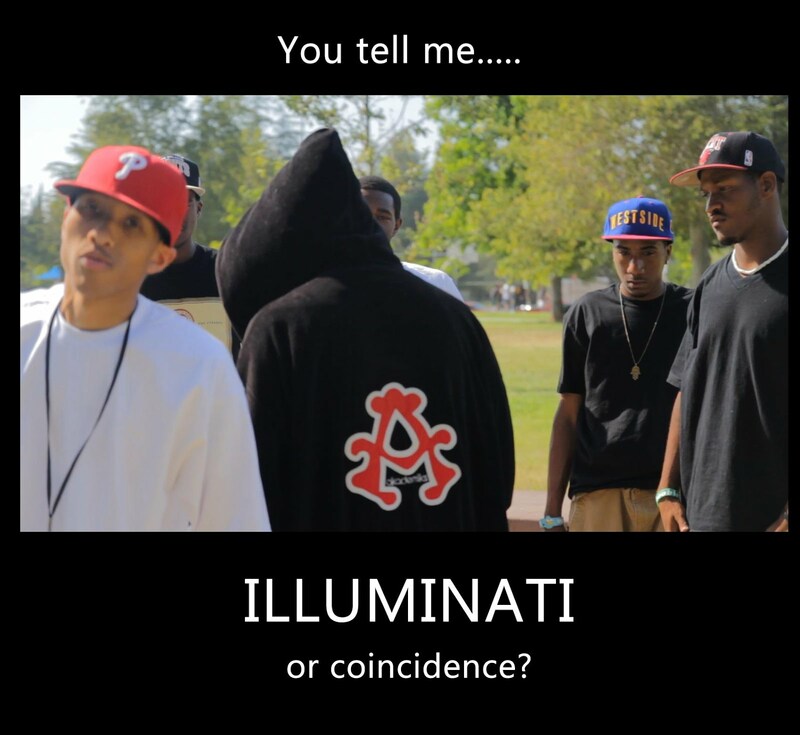 Watch A.D's "Tell Me Different" [Official Music Video] behind the scenes footage as A.D. takes you on a tour around BHS displaying some historical moments w/Ming, Artis & Jamal! 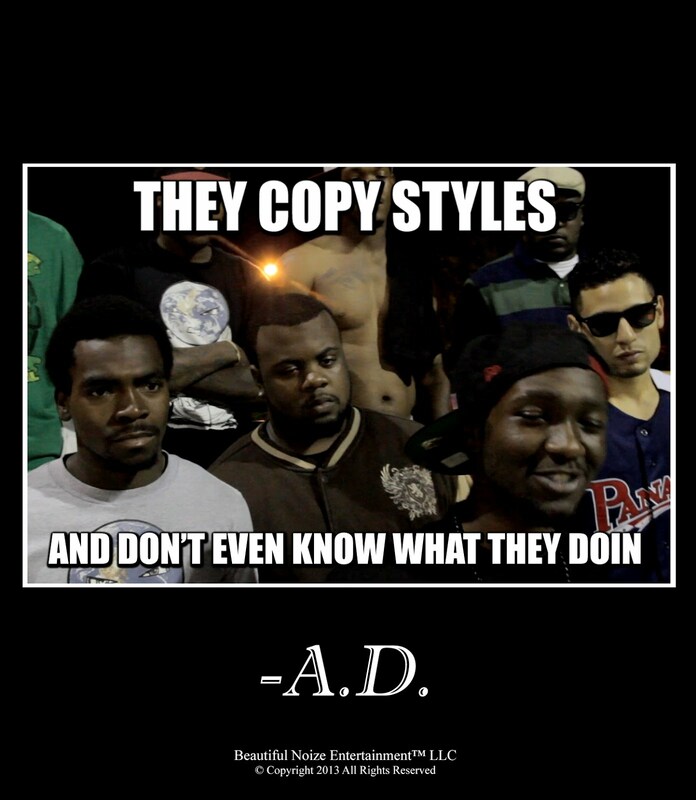 Music video by A.D. from his "Mic Theory" Mixtape. (C) 2013 Beautiful Noize Ent., LLC. - God Gave Us The Talent, We Give You The Music. 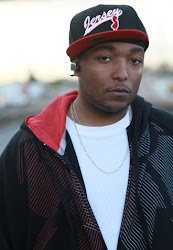 A.D., derived from his name Anthony Dwayne Soil Jr., showcases the heart of the west coast through his eyes and percolates such deep soul in his lyrics. Tell Me Different— listed as “Heart & Soul” (track 8) on Mic Theory— is a gritty, passionate, down-to-earth Hip-Hop track with a true personal feel, allowing an open window into A.D.’s life. Tell Me Different (Heart & Soul) features calculated direction and crisp cinematography by Beautiful Noize Entertainment CEO and producer Jaquan “Artis” Barnett, as well as precise editing by Ming Louie. Follow A.D. on Twitter: @Bt0ne. 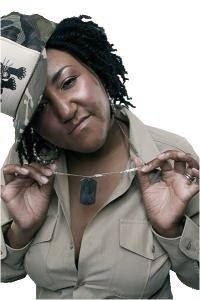 Follow Beautiful Noize Ent: @BNEnt. 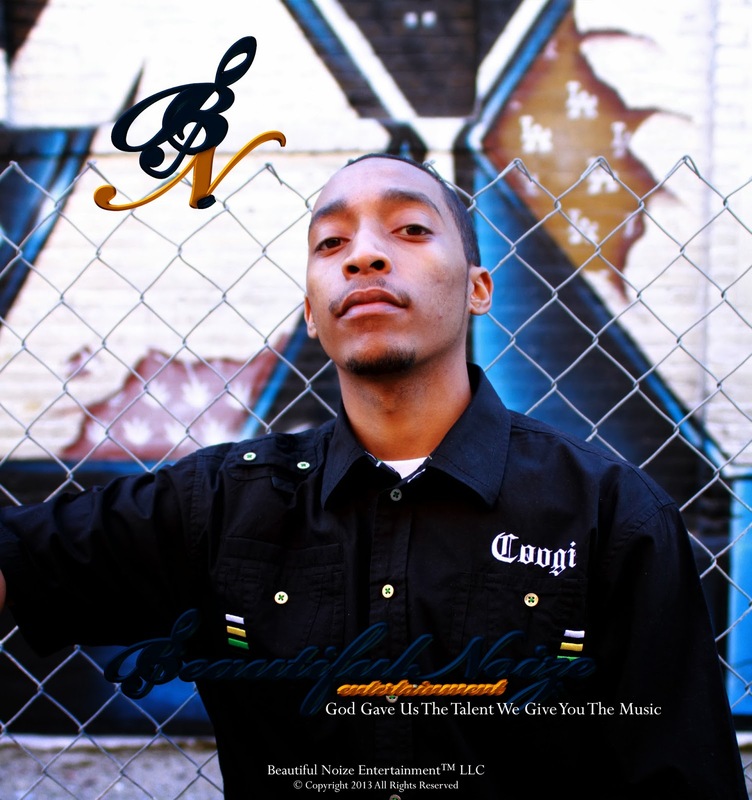 Visit www.beautifulnoizeent.com. Music video by A.D. performing Tell Me Different. © 2013 Beautiful Noize Ent., LLC.